ORDINARY MOMMY DESIGN: DIY Christmas Yarn Tree Tutorial. 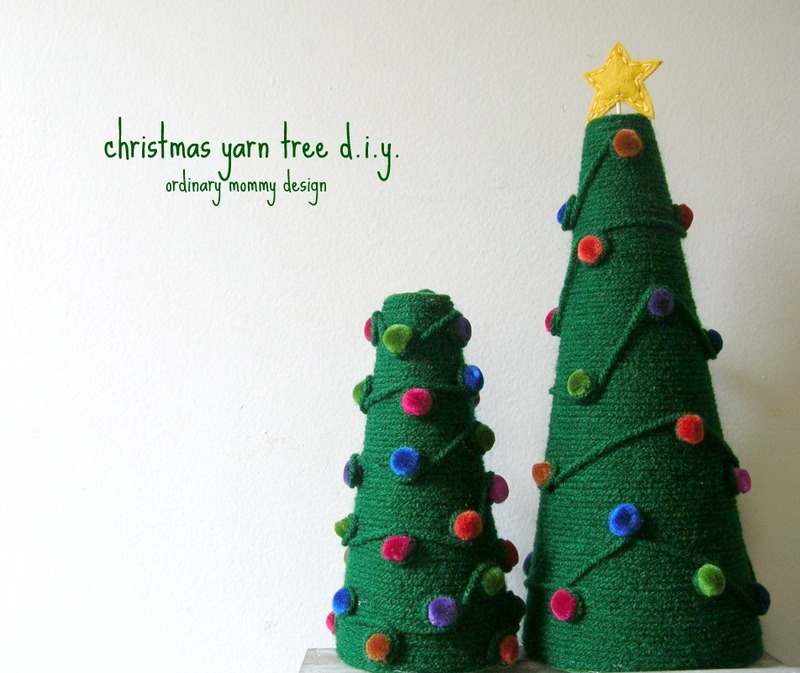 DIY Christmas Yarn Tree Tutorial. The Christmas bug bit me a little bit harder this year, and I decided that I wanted to do just a wee bit more decorating than usual. 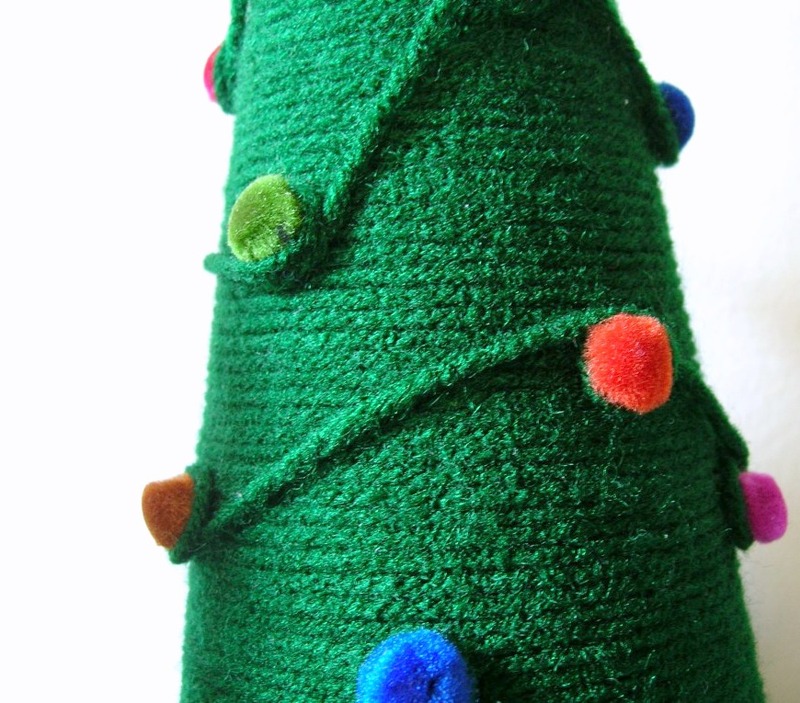 My great-grandmother had beautiful dark green ceramic Christmas trees in her house when I was growing up. An electric candle went inside, and when lit the dark, richly colored bulbs would cast a dull, warm glow. I am blessed enough to have one of those trees now, but the candle is missing, and I'm always afraid to put it out for fear one of the wee ones will knock it over and break it. 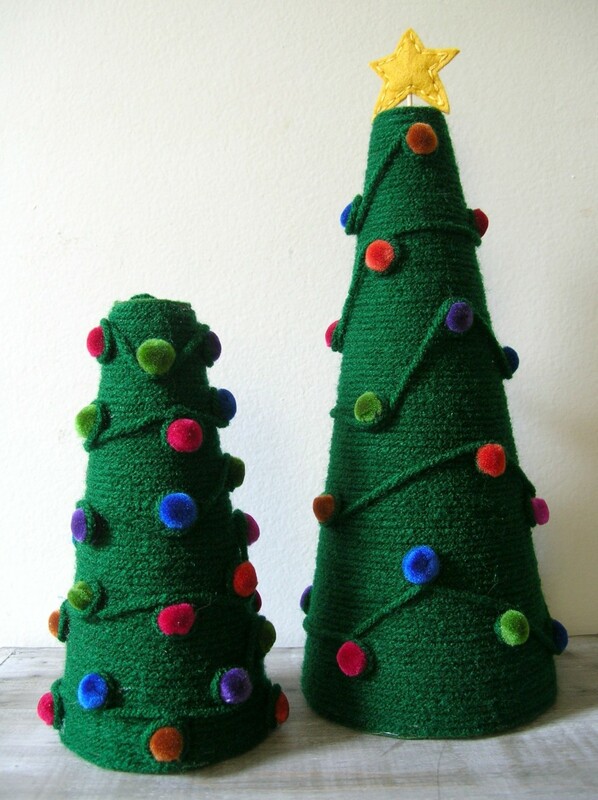 So this year I thought it would be fun to re-create the look of that tree with yarn and pom poms. One trip to the craft store later, and I had all the materials I needed to create a couple of fun yarn trees inspired by my great-grandmother's vintage tree decoration! 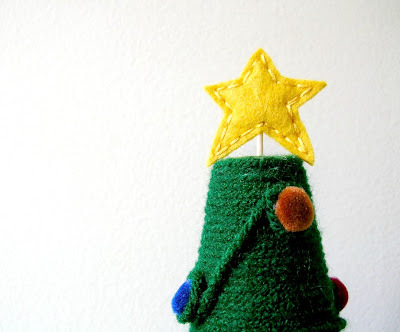 If making a star for the top you'll also need: felt, matching embroidery floss, sewing needle, a wee bit of polyester fiberfill, toothpick. 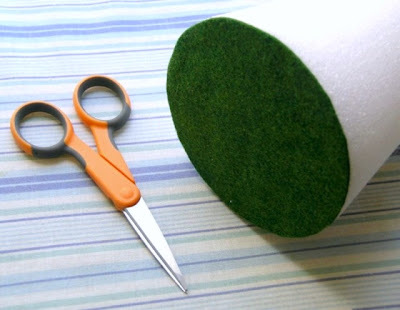 To start, cut two circular pieces of felt that will cover the very top and bottom of the styrofoam cone. Adhere them using hot glue. *A note about using hot glue with styrofoam: exercise great care not to melt the styrofoam by touching it with the hot metal tip of the glue gun. Run a bead of glue along the bottom of the cone to keep the yarn in place, and then proceed to wrap the rest of the cone with the yarn. 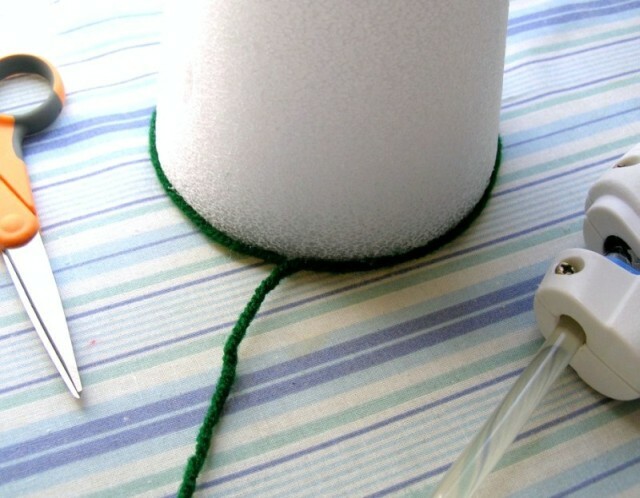 Once at the top of the cone cut the yarn and use hot glue to keep the end in place. 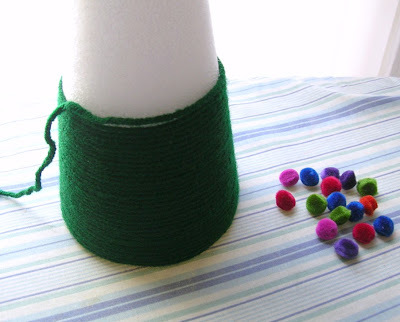 To create the look of lights, put a dab of glue on the back of each pom pom and stick it in place. 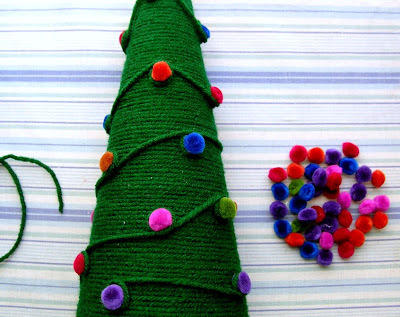 Then, starting at the uppermost pom pom, take a piece of yarn and run it from one "light" to another, wrapping it once around each pom pom in the tree as you pass it to create a "string of lights". Once you have the string arranged in a way that looks pleasing put a dab of hot glue at the beginning and the end to hold the string of yarn in place. 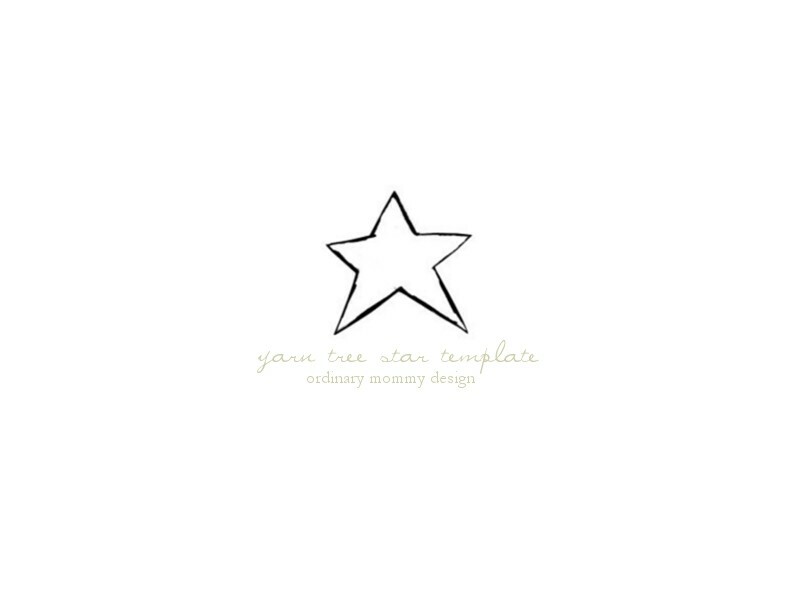 If you decide to add a star to one or more of your trees, you can use the template below. 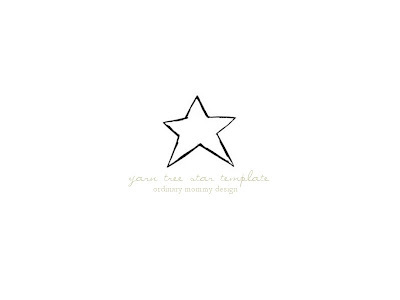 Be sure to click on the image and print it in original size so that the star will be the correct size. Once you've printed the template cut two stars from the yellow felt, and stitch around the edges. Lightly stuff the star with fiberfill before stitching it shut to give it a bit of dimension. Slide the toothpick into the star, and then gently push the toothpick into the styrofoam on top of the tree. I did the smaller tree first with my four-year-old daughter, and we went a little crazy with the pom poms. 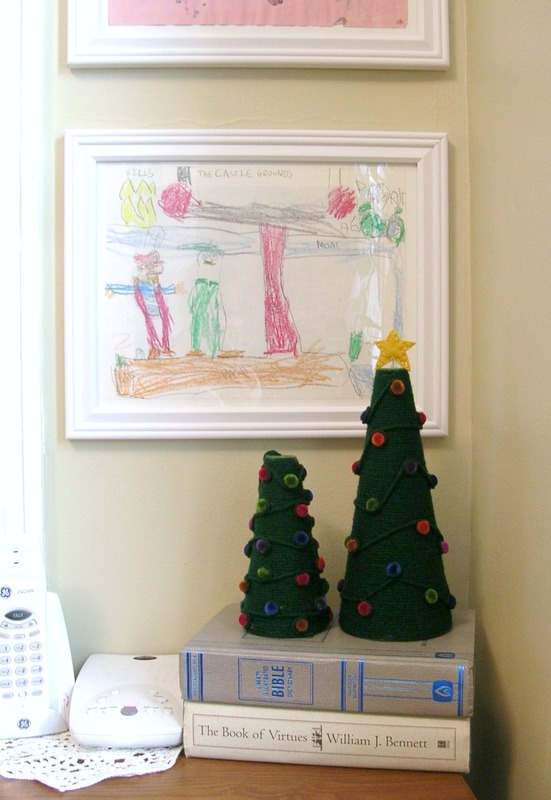 When I did the larger tree I placed the pom poms farther apart, and I believe I like that better. However you decide to do it, have fun, and I hope that these little trees add more merry to your holidays! cute cute cute! I love it! Oh so crafty and festive! Ready to go to the craft store! 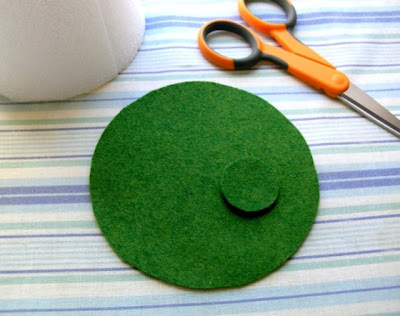 this tutorial is really great and so cute! So cute!! I definitely need to add this to my list of ideas for next year!